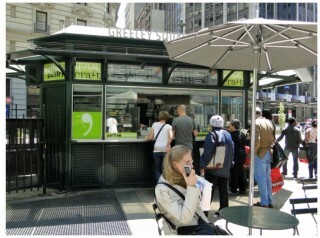 Greeley Square in midtown Manhattan. Note: all photos in this post can be viewed at larger size; just click on each image. 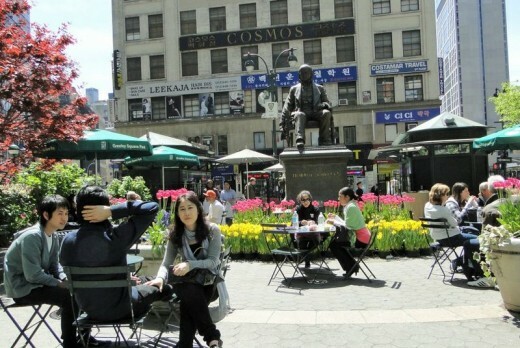 What would Horace Greeley, America's most famous newspaper publisher and editor, think about the changes to the square bearing his name -- looking down from his bronze chair? Probably, "there's a good story here!" He'd be right. The transformation of Greeley Square from a rundown, orphaned park to a lively, busy place is indeed a good story. It also could serve as Exhibit A in demonstrating the principles highlighted at the recent Project for Public Spaces workshop I attended. 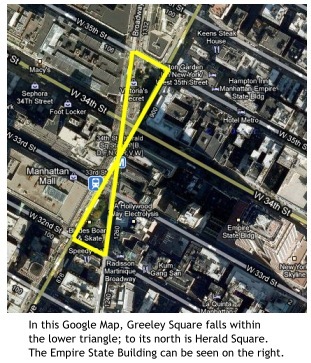 New Yorkers call Greeley Square a "bow tie" park since it is twined with the reverse triangle of Herald Square. Together they take on the shape of a bow tie. In a posting last week I wrote about the importance of seating and, in particular, the emphasis PPS places on movable chairs. As with many principles of urban space design, this harkens back to observations first made by William H. Whyte: "Chairs enlarge choice: to move into the sun, out of it: to move closer to someone, further away from another. The possibility of choice is as important as the exercise of it." From Whyte's City: Rediscovering the Center. Even on a short visit to Greeley Square, you can see the benefits of movable chairs, as people arrange the chairs where they like -- alone, in pairs, or in small groups. The single most important sign of a successful park according to PPS staff is not how pretty it looks from the air, but how active it is on the ground. While there are many important ingredients in helping ensure active use, the one that I kept hearing over and over during the PPS workshop was "good management." As PPS Vice-President Kathy Madden said, "Eighty percent of the success of any space has to do with how it is managed." This single factor has, in large part, been responsible for the transformation of a growing number of New York City parks. 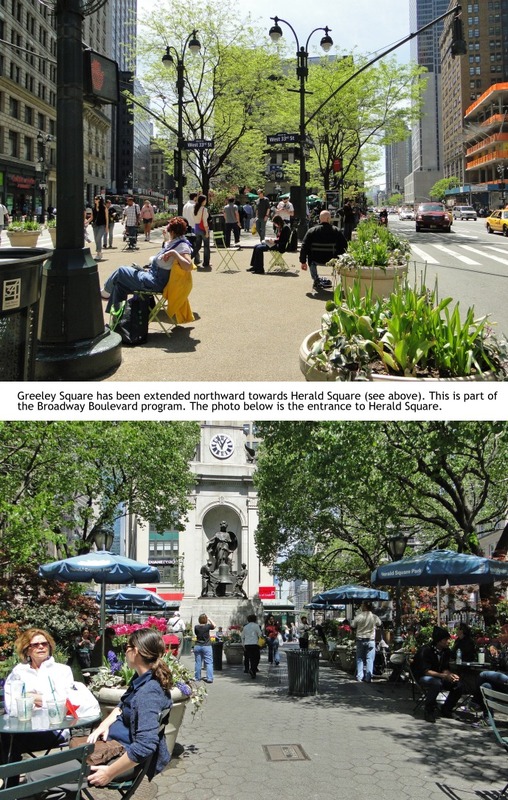 Urban designer Norman Mintz noted that: "Greeley Square used to be a place you did not want to go to. Today, you can be hard pressed to find a place to sit during lunch hour." 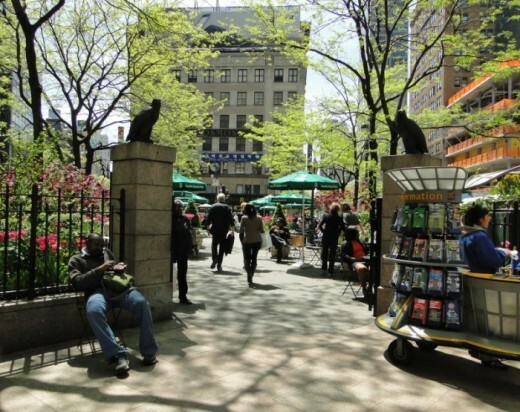 In Greeley Square, as in a growing number of other New York City parks, a private nonprofit manages the park and programs activities. In Greeley Square's case, it's done by the 34th Street Partnership. So what does this mean, on the ground? For one thing: getting many small details right -- details that add up. How about restrooms you can actually feel comfortable going into? Yes, those flowers were actually in the Greeley Square public restroom when I visited (and, yes, it felt strange taking a photo inside a restroom!). How about a vending stand where you can not just get a bite to eat, but a delicious sandwich? Great care went into selecting the food vendor, 'wichcraft. How about a park that's kept nice and clean all the time, not just once a day? 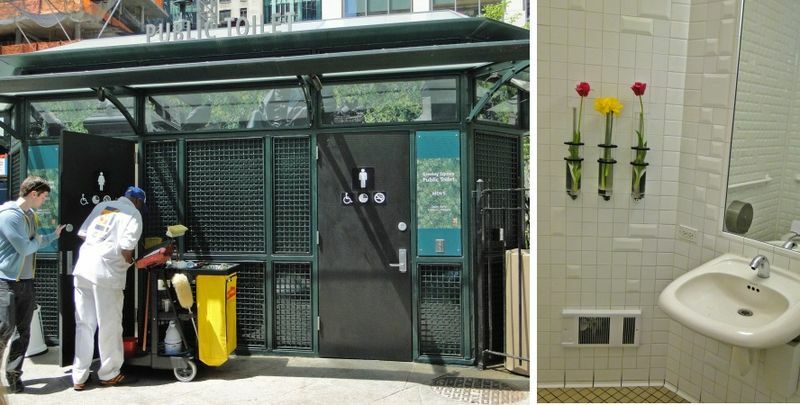 How about all sorts of details, from the design of the trash receptacles to the availability of information for visitors? (Incidentally, the information stand has a big benefit beyond providing maps and fliers, it also provides another pair of eyes on what's happening in the park). Fred Kent, President of PPS, said that one question that often comes up is how to deal with vagrants or homeless people using the park. His answer: that unless they're causing a disturbance, let them be. As long as the park is well-managed and maintained, it will attract other users. With enough activity, people will see the park as a place welcoming to all. Who pays for all this? In New York City, as I noted, there's a definite move towards park management being handled by nonprofits. But it's not just in New York, I also reported on this last Summer during a visit to Detroit, and it's a trend nationwide. Funding sources for park management vary. For the 34th Street Partnership (which manages both Greeley Square and Herald Square under an agreed-upon plan with the City) the primary source of revenue is from special assessments on property within its business improvement district. This is supplemented by income from the food vendors -- another reason why ensuring quality food is important -- and sponsors of events taking place in the park. Revenue from these "supplemental" sources is a much bigger factor in larger spaces like Bryant Park. As you can see from the 34th Street business improvement district map above (click on it to view it at larger size), the BID is quite large, stretching from Park Avenue to 10th Avenue, and ranging between 30th and 36th Streets. It has a staff of 154, including 63 in sanitation and 36 in security. In 2009, it received $9.3 million in revenue from special assessments on properties within the district. For more details about the 34th Street Partnership BID. 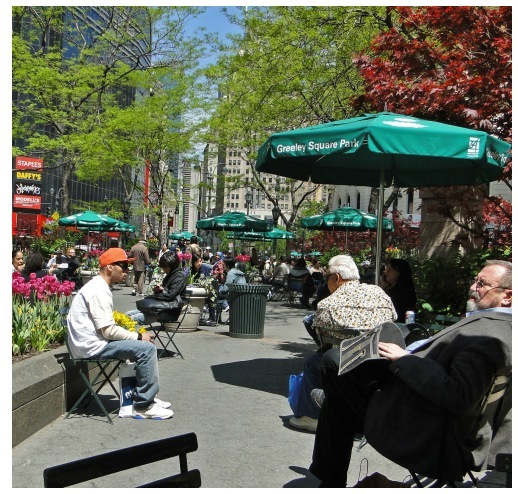 Note: See also Beth Humstone's PCJ article, "Turning Downtowns Around: Business Improvement Districts" (supplementing her article, I take a closer look at the enormously successful Bryant Park BID). For cities, the benefits of strong urban parks are considerable. Not only do they provide pleasant, enjoyable places for residents, shoppers, office workers, and tourists to use, but they are financial catalysts for cities. Indeed, with New York City seeing so many benefits from its resurgent urban parks, it's no surprise that the city officials are among their biggest advocates. So, as Horace Greeley no doubt would have told you, "there's a good story here!"